You are not logged in. [Log In] Pond Boss » Forums » INTRO » Questions & Observations » Limestone good for using along banks? 14 registered (Brad Holister, bassmaster61, Jjksswan98, Zep, Shorty, BrianL, Clay N' Pray, Bing, ShaneM, Bob-O, Bocomo, teehjaeh57, RStringer, rjackson), 198 Guests and 183 Spiders online. #111806 - 03/17/08 07:57 PM Limestone good for using along banks? Limestone might be the most commonly used riprap. It looks good and has the (slight) benefit of lime eroding off of it into the pond. I use it for riprap and it's just fine. As far as some of it dissolving in the water I wouldn't count on it if you wanted it too. It's doesn't dissolve very fast which to me is a good thing as my water is already hard enough to walk on. 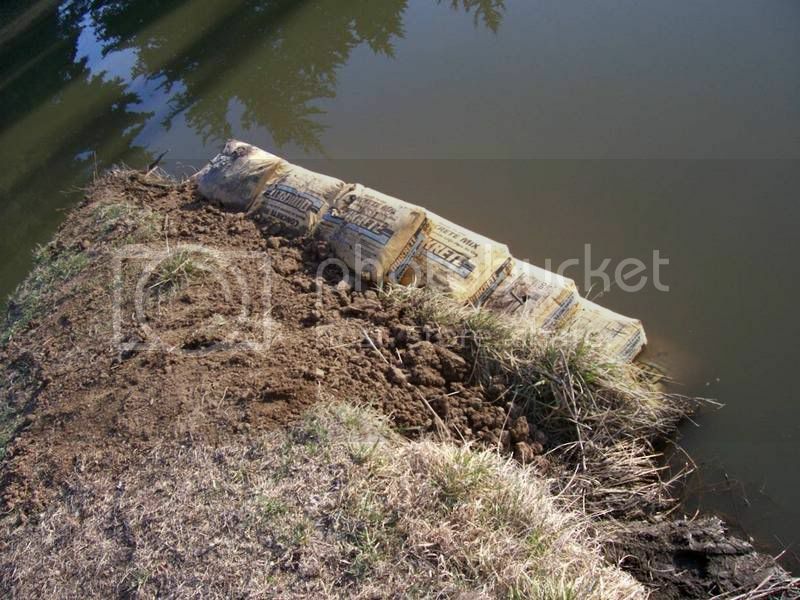 Anyone used quikrete bags like this for erosion control? I haven't but it looks like it would definitely work. I have bought premixed bags before and accidently exposed one to moisture, and it turned into one solid block! My issue is what to do with the bags, they are supposedly biodegradeable, but I hate for them to end up in the pond. I've seen the railroad use the bags of quickcrete around a sign post on my way home from work. It's been there for over a year and the bags still have paper on them. If you go with limestone, it's wise to put down geotextile fabric first. The cost of the fabric is quickly offset by reduced replacement rock and it slows down the weeds a bunch. I just got done using a little over 100 Quickrete bags to encase the ends of my 2ft diameter culvert that goes across one of my creek beds. I then drove 25 four foot sections of rebar through the bags in many different angles to tie it all together. I am planning on putting the driveway on top to get to the new house site. I had 3 inches of rain in the last 2 weeks and everything is still perfect and the bags seem to be already set up. I am going to wait about 6 more months or so to be sure everything has been set up and then I am planning on burning the paper off. We will see how that works. Water dries, rocks crumble, and trees die. The only thing that is eternal is the reputation we leave behind. 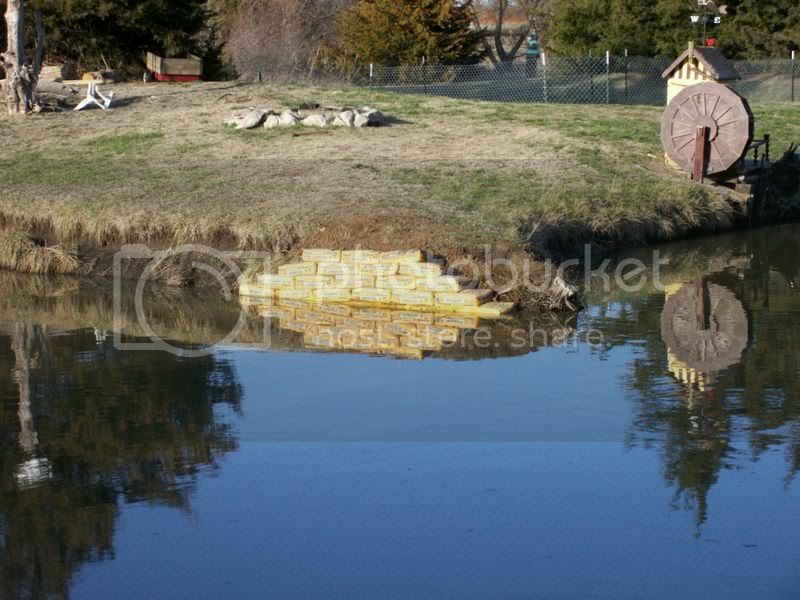 Here is a website about our pond, it has pictures on the photo page. This might give an indication of what we are up against. We are also considering just adding the quikrete bags at various points around the pond, and fill in with rock in between. I just did a rough estimate for 1 mile of shoreline with the quikrete bags and it would cost over $70K. Ouch! I can't open the website here from school, so I am guessing in the dark here, but have you thought about grading the shoreline with a dozer and putting down hydro-mulch/seed mixture? Maybe put down a silt fence to keep everything from washing out? You may be able to use regular seed if you are lucky. You could do a quarter to half mile at a time so that the expense doesn't get too high. Well we are going to try the quikrete idea, it seems that we could do that slowly. I actaully measured and I have approx 1800 ft of shoreline. So I am of to the hardware store to get 25 bags, and we are going to put them down tonight. Well yesterday afternoon I put down 25 bags of quikrete. I rebarred them all together, and left rebar up out of the bags that will eventually have bags set upon them. According to quikrete's website it is best to not stop and do this continuous. That would be great if I had all the cash for this project, but I don't so it will have to be done as I acquire cash. One thing I found out quick is that quikrete gets very heavy, especially if you are standing in a pond with waders on. So next time I think I will have several people here to help me, and we will put down approx 100 bags at a time. That is if this works out, this is my test area. I am trying to upload pics, I hope they work! The bags are stakced 5 high, that equals about 2 ft. Once that last bag goes on it seems a little unstable, that is until I drove the rebar in, then everything was fairly sturdy. I backfilled with dirt and planted fescue right behind the area, and started watering. I want the grass to take off quick, because as you can see the actual bank is higher than the quikrete bank. This side approx 80 FT, is the highest drop off point we have all around the pond. The bags are already starting to set up. In the next few days I am going to watch closely, if everything seems ok, I will start adding to this. 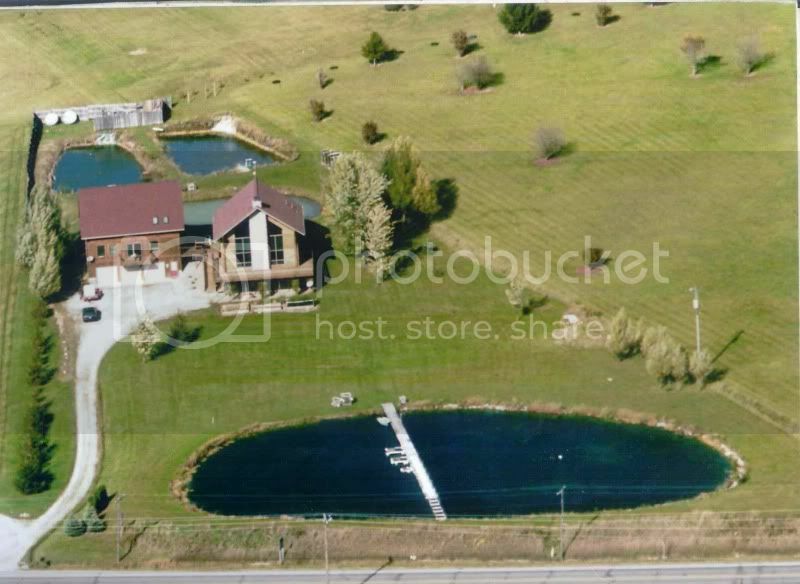 My rough estimate of cost is around 25K to do the entire pond, which is approx 1800 ft. Undoubtedly you can get sakcrete in bulk quantity deivered much cheaper than picking up and hauling it from big box stores. I would look into having it bulkheaded for the prices you are talking. Well I usually don't go to the big box stores, I live too far away. I am using a local lumberyard that is very big in the contractor business. They usually cut me deals on large quantity of items. But I checked on quikrete, if I buy 1,000 bags they still can't cut me a break supposedly. But they will deliver it for free, and that is worth a lot. Right now it is costing me $3.49 per bag, but they say it will go up significally April 1st, but they don't know how much it will go up. 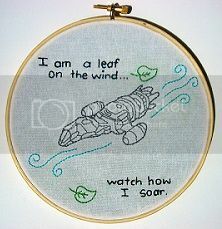 I am going to do some checking around with other places, but there is really noone else close, and I want it delivered. Wow......it seems like you would be better off trying to level out the slope of the banks with some heavy equip instead of spending $25K on concrete. Good luck to you. I agree I would have come in with a backhoe and reduced the slope and then seeded. We have thought about bringing in equipment in here to work on the slope, but I can barely get a riding mower back there. The people who lived here before planted over 150 cedar trees in the last 30 years. It makes it very hard to get euipment around the property. You have the same problem I do although I can't get to one of my banks for a different reason. I would have to cross my neighbors property with heavy equipment and he's not keen about me tearing up his yard (I don't blame him). My plan will be to have large chunks of limestone delivered and I will have to take them back to the washout area by wheel barrow. It will be good exercise to say the least! The good news is the washout is limited to a couple of small areas. No way to cut a few trees down to get in? I really hate to cut trees down. This property is very unique, and we love the trees. Teh trees hide the property, so no one really knows what is back here, I really want to keep it that way. This is why we like the quikrete idea, we can bring the quikrete to the backyard with a trailer behind the mower. No need for big equipment. Yeah I know what you mean. Trees take so long to get big it's a shame to cut them down. My parents planted a lot of trees growing up on our property and it was absolutely beautiful. Took at least 30 years to get that way. They sold the property when they retired and the idiot that bought it cut every last tree down for no apparent reason. Kind of warped if you ask me. Who doesn't like trees that are doing no harm or need to be harvested. Toolmaan78, take it from me, listen to Ryan Freeze!!!! Go with limestone and the geotextile cloth. It will save you a lot of work and expense later. Limestone is cheap even in the rip-rap size. The stuff i put around my pond is about the size of a cabbage. I had put smaller stone the first time, #4 and it washed away. The limestone looks great and if you use the bigger size it won't move. Also be sure to use the cloth underneath. It keeps it from sinking and it also keeps the grass from growing through it. I used the cloth under my limestone. The problem I ran into was, when they delivered the stone it had dirt mixed in with it. So now, I have grass growing in it and it's very hard to control. Also, take Ryan's advice and get a slinger truck if one's available in your area. I used a bobcat and it was a lot of work. You still had to hand place a lot of it. I looked at another thread that Ryan posted that I had missed. I see pics of your pond and his pond and they look great. My issue is hand placing everything, which I am willing to do as long as my back can handle it. At this time I am sitting and waiting on what my quikrete bags do, they have all set up rock solid so far. #2 was the largest I could get with the slinger truck. When they delivered the #2 limestone at my place, the cost was $15 per ton for material, placing, and 80 miles round trip. At this rate 100 tons would only cost $1500. The money saved compared to using the Quikrete would easily pay for the cost of cutting down a few trees and replacing them with large ones. Would it be possible to curve a driveway through your trees so you'd still have privacy?